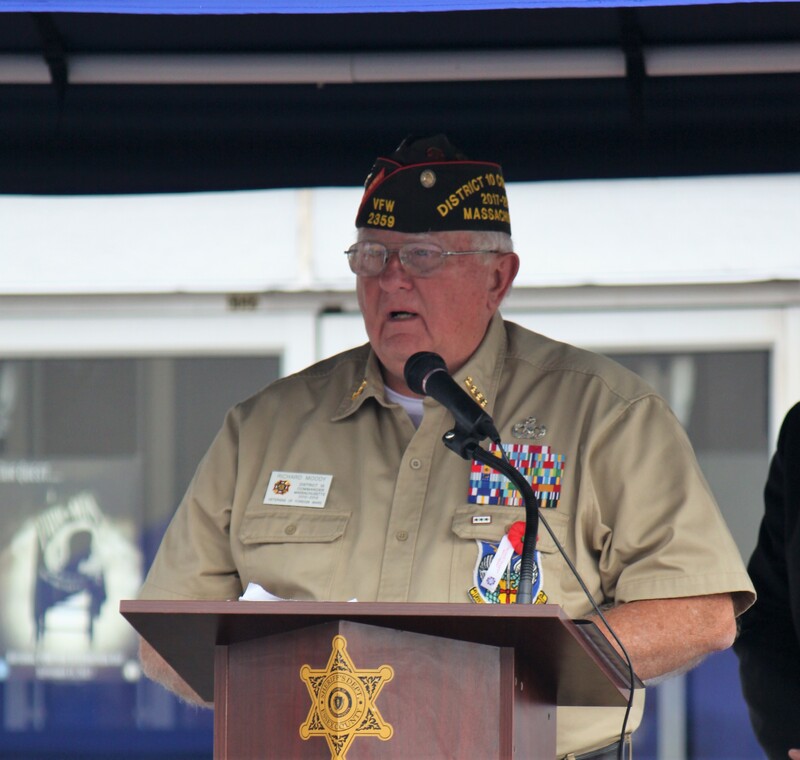 Essex County Sheriff Kevin F. Coppinger led a service last week on National POW/MIA Recognition Day to remember Prisoners of War and Missing in Action. The ceremony was held at the Essex County Sheriff’s Department (ECSD) Headquarters in Middleton next to the Vietnam War Veterans of Massachusetts Missing in Action Memorial which was unveiled on March 29, 1994 at the ECSD Headquarters. It is the only monument in Massachusetts to recognize the Vietnam War Missing in Action soldiers. The names of 55 soldiers missing in action from the Vietnam war are engraved in the black marble monument. At the top of the monument is an engraved a dog tag with the date “1965” representing the year America’s full troop movement into Vietnam on the left side, while the right is blank, signifying the Massachusetts soldiers still MIA. Engraved on the sides of the monument are the emblems of the five branches of the military: the Army, Navy, Marines, Air Force and Coast Guard; and the five major Veterans organizations: Vietnam Veterans of America, American Legion, American Veterans, Disabled American Veterans, Veterans of Foreign Wars. The ceremony included Rolling Thunder Massachusetts Chapter 1, Bagpiper Lieutenant David Lane from the Middlesex County Sheriff’s Department, USS Constitution Color Guard, Essex County Sheriff’s Department Honor Guard, ECSD Recruit Class 17-01. 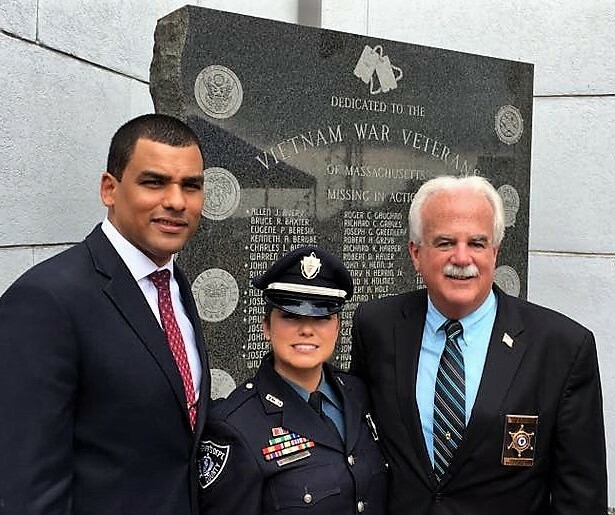 Massachusetts Secretary of Veterans Affairs with Toni Wakester and Essex County Sheriff Kevin Coppinger. ECSD Sergeant Ann Zannini sang the National Anthem while USN Sea Cadet Officer 3rd Class Michael McAuliffe Jr. and Seamen Devon McAuliffe raised the flags. Earlier in the day at 0800, the same flags were raised over the USS Constitution in Boston. The U.S.S. Constitution is depicted at the bottom of the monument in recognition of the fact that Old Ironsides was the first naval ship to have anchored in Da Nang, Vietnam on May 10, 1885. This is why these flags were flown over the U.S.S. Constitution this morning and why their Color Guard honored us with their presence at this ceremony. ECSD Officer and Army Combat Veteran Toni Wakester led the Pledge of Allegiance, Chaplan, Paul Shoaf Kozak delivered the invocation. ECSD Captain Statezni read the Missing Man Table Ceremony, which is the setting of a separate table in honor of our prisoners of war and those Missing in Action and has been a tradition in place since the end of the Vietnam War. The manner in which this table is decorated is full of special symbols to help remember and honor those soldiers who are not with us. During the research for event, 16 additional soldiers have been returned to us since the monument was originally unveiled. 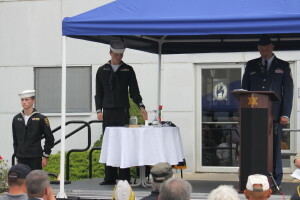 Retired Lieutenant Colonel Richard D. Moody read the names of the 16 returned as well as 39 names of the soldiers still Missing in Action. Massachusetts Secretary of Veterans’ Services Francisco A. Urena spoke regarding the importance of paying tribute to and remaining diligent in the search for closure of all soldiers remains being returned to their families. Timothy Sullivan from the Fighter Squadron 151 flying F-4B Phantoms spoke of how he was shot down with his pilot Paul Schultz over North Vietnam in November of 1967 and survived a five year captivity as a prisoner of war. In closing, the Northshoremen Barbershop chorus group sang a fantastic rendition of “America the Beautiful”.